Alternating current supplied electrically conductive method and system for treatment of blood and/or other body fluids and/or synthetic fluids with electric forces. Science is a strange world. Studies can take up to 10 years, and often only lead to a conclusion that more study should be done. When research scientists discover something it could take decades, or several lifetimes for the science to make it into the mainstream. The common person may never hear about breakthroughs in science. Science may discover that an herb has cancer killing qualities, or that electricity or certain frequencies can disrupt cancer cells, but until they can figure out WHY, the science is not done. The research will go on and on. Frustrated by this exact sort of thing, Dr. Hulda Clark left government funded research and decided to publish her findings in her books. Doing such a thing was blasphemous to the scientific community. Research should always lead to more research. That is how research scientists make their living. For Dr. Hulda Clark to publish directly so that you and I can immediately benefit from Dr. Clark’s herbal parasite cleanse and zapper was a very bold move on Dr. Clark’s part. Hulda Clark published most of her books while in her late 70′s. In Dr. Clark’s HIV/AIDS book (see page 591: The Story of L-G) she wrote that during her lifetime she battled with her own “incurable” disease, a rare form of infection that had gotten into her eyes and was crossing the blood brain barrier giving her brain herpes. Medical doctors have no cure for herpes, so Hulda Clark had to venture out into the world of alternative medicine and discover answers to extend her life. Hulda Clark discovered ways to boost her immune system with herbs, minerals, amino acids, and electronic frequencies. All her research started her on the path that made her famous as an author and led to the invention of the Hulda Clark Zapper. She was able to do the impossible and cure herself from a disease that she had been told was going to eventually blind and kill her. When faced with her own disease, her enthusiasm for discovering solutions brought her to writing her books and using her methods to help others. By publishing several ways to boost the immune system Dr. Clark helped many people. The testimonials and book reviews show how much of an impact her books have. Scientists may take a long time to research their discoveries, but when something looks promising, they quickly protect their discovery by requesting a patent. 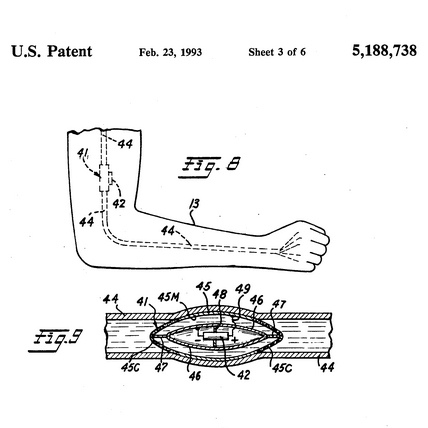 The above patent more than likely was inspired by the work of Royal Rife and Georges Lakhovsky, and in turn inspired the Zappers made by scientists like Bob Beck, Hulda Clark, and others. The best thing is that Hulda Clark’s Zapper was published to the Public Domain, so you can build or buy a zapper today. You don’t have to wait several decades for more research to be done. This entry was posted in Secrets of the Universe and tagged bob beck, cancer research, frequency, georges lakhovsky, hulda clark, hulda clark zapper, nikola tesla, royal raymond rife. Bookmark the permalink.